In December 2018, Disability Rights Washington’s AVID Program finalized a settlement agreement with Yakima County to improve the conditions for individuals with mental illness and other cognitive disabilities housed at Yakima County Jail. This settlement agreement was the product of about two years of collaboration and will be monitored by the AVID Program and a neutral expert to ensure the Yakima County Jail’s compliance with the terms of the agreement. 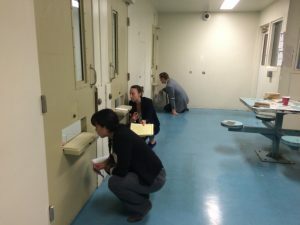 DRW attorneys speak to Yakima County Jail inmates through cell doors. From left to right: Sarah Eaton, Kimberly Mosolf, and David Carlson.